Here is a (hopefully helpful) interface for z-Tree laboratory experiments. 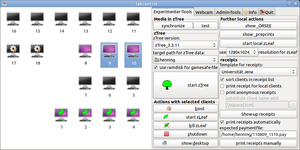 labcontrol was intended to be an easy tool of controlling our laboratory at university and it is still in development. Most options are configurable with Gconf. If you find the software useful, you are free to use it under the GPL. Install wine (from the package manager of your distribution). Stability: with wine before version 1.5.12 zTree is stable. With versions of wine from 1.5.12 there is a problem: It is possible that a newly started client does not show up with its name in the client table. Instead you only see an empty line. This is due to Bug 35041. Recommended: use taskset -c 0 wine zLeaf.exe. Alternative: Before you start a treatment kill the zLeaf, start it again. It should now appear under its proper name. Install wine (from packages or from ports). Jonathan Page has written a tutorial for running z-Tree on OS-X with Wine. For those who use R, I have written a small R-package zTree to help you import data from z-Tree into R. It provides three commands, zTreeTables, zTreeSbj, and toLongDate. filelist: a vector of z-Tree (xls-) filenames. tables: a vector of table names. If you leave this empty, globals and subjects will be read. If you set tables=NULL, all tables will be read. The return value is a list of all merged tables. files: a vector of z-Tree sbj-filenames. The return value is a matrix. dates: a vector of strings, each element an 8-digit old z-Tree date, e.g., "091112JN". The return value is a vector of translated dates. options(zTree.silent=FALSE): set to TRUE to get more feedback. options(zTree.encoding="LATIN1"): adjust, if you have recoded your files. For those who (still?) use Stata, Kan Takeuchi has written a utility to import data from z-Tree into Stata. TreeRing allows you to inspect and to extract data from GSF files. Read more about z-Tree at the z-Tree-Wiki.